Drew McIntyre talks to the media as he exits the PC. 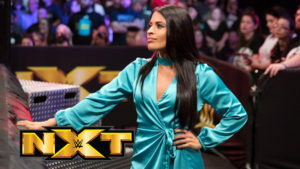 As he gets into the interview, Zelina Vega interrupts and asks why Almas hasn’t received his title contract yet. McIntyre says when Almas stares him eye-to-eye like Roderick Strong did, he’ll agree to it. Until then, adios. Before the match, Vega takes the mic for a promo. She says they’ve waited a week for a contract, but nothing yet. She notes you don’t become as successful as her by being a patient woman. She runs down McIntyre and accuses the champ of ducking Almas. Strong’s music hits and we get underway. Counters and reversals rule the first few exchanges. They block each others’ hip toss, then Strong catches Almas for the first of sure to be many back breakers. He follows up with a loud chop that Vega even shutters at. They make their way to the apron where Almas hits a knee and slings Strong down. Almas stands tall as we go to break. We come back to a thunderous chop by Almas. Roddy gets back up to try and return the favor, but Almas catches him in an arm bar on the rope and breaks at four and a half. Almas in firm control now, stretching out the arm and shoulder of Strong. Strong fights out and hits an arm drag that sends El Idolo to a spill through the ropes. Almas back and it’s a slugfest. Leapfrog into a leaping lariat by Strong to switch momentum. Pop-up gut buster by Strong. Goes for a corner attack and Almas gets a boot up. Strong catches Almas in the ropes this time with a stretch using the ropes as leverage. Almas subtly taps but not used since ropes are involved. Strong back on the apron and slams Almas’ back as he drops him onto the hardest part of the ring. Almas counters a spot with a tornado DDT and gets a near fall. Strong misses a tiger driver, lands in the corner, and gets the double knees from Almas for a two. Almas looks for the hammerlock DDT, but Strong slips out. A pair of back elbows sets up for the running knees again, but Strong pops up for a high knee of his own. Strong on fire and ends with a wrecking ball drop kick. On his way back in the ring, Zelina Vega comes out of nowhere to hit a hurricanrana on Strong that sends him into the steel steps. Almas retrieves his prey, hits the DDT, and gets the win. What a spot. Good match. After the match, Almas and Vega head to the announce table and grab a mic. Vega says Almas will meet McIntyre face-to-face next week to see if Drew is a man of his word. Drew McIntrye is conducting interview when gets interrupted by Zelina Vega. She says Almas and McIntyre have a lot in common. She asks if he’s been dodging Almas. Drew acknowledges she’s good at her job, and reiterates he’ll fight anyone, anytime, anywhere. If he really wants the match so bad, McIntyre says Almas needs to ask for it face to face. Both superstars have a physical back and forth match. At one point in the match Vega takes off her jacket and she reveals a DIY shirt. Gargano does not allow that to distract him, but Almas gets to the ropes. Vega gets on the apron and says something to Gargano. Gargano says DIY means nothing to him. Almas with an inside cradle for a near fall. Almas goes for a one arm power bomb but Gargano with a sunset flip for a near fall. Gargano wtih a super kick and he goes for La MIstica but Almas sends Gargano into the turnbuckles. Almas with the running double knee strike to the back and he does it a second time. Almas with the hammer lock DDT and he gets the three count.